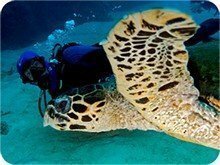 Our PADI 5* Dive Center in Khao Lak offers you a wide range of PADI courses Khao Lak. From Open Water diver to Divemaster, learning scuba diving in Khao Lak is fun and relaxing. Looking for a dive school in Khao Lak? 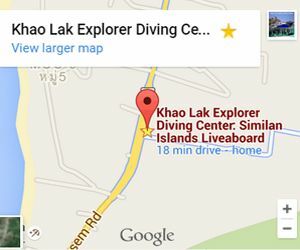 Look no further Khao Lak Explorer dive center will take you diving in a safe and fun way! You do not need to have any previous diving experience to start! 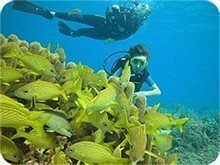 PADI courses in Khao Lak can be done either in local diving (cheapest option), at the Similan national park during daytrips or liveaboards. Would you like to try diving for the first time? If you have never dived before or do not have a diving licence and, this is for you! The Discover Scuba Diving Program is designed to introduce you to the world of diving. You will experience your first dives with one of our professional instructor. 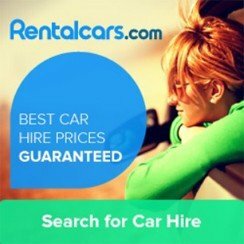 He will explain to you the basics of diving theory and then you will go for 2 dives in the beautiful clear blue water of Khao Lak or the Similan Islands. This amazing experience will allow you to explore the beautiful coral reefs and different species of marine life of Khao Lak diving. But haven’t been diving for a few year! Joins our Refresher Course Program ! We will get you ready to go back in the diving world. The Open Water Diver certification is the world most known and popular scuba diving course, and has introduced millions of people to the diving lifestyle. 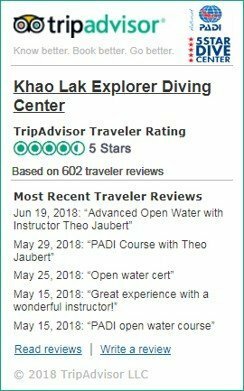 The Open Water Diver course can be completed in three to four days and consists of three main phases; Knowledge Development, Confined Water Dives, and Open Water Dives. The first day or two, you will do the knowledge development in our outside study area and confined water dives in a swimming pool specially design for diving. 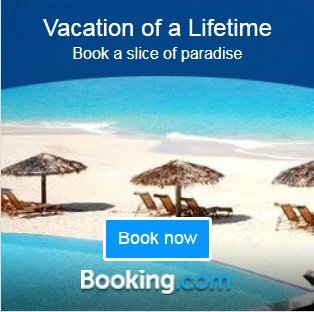 The last two days, you will be diving to the location of your choice either local dives or at the Similan islands where you will practice dive skills and explore the amazing underwater world! The Advanced Open Water Diver course will increase your confidence and build your diving skills to the next level. Getting down to 30 meter, will allow you to not miss any interesting parts of the dive sites. Becoming more confident in the water, having a better buoyancy is a great way to improve the pleasure while diving. Getting more dives supervised by your instructor while discovering and learning more about diving will give you great confidence for your future dives. Rescue Diver Course is best described as the most “Challenging” and “Rewarding” diving course. Through the 3 days course, you will learn how to manage all different scenarios of dive accidents. Before taking this course, you need to have completed the EFR (Emergency First Response) course or any kind of First Aid certification. After taking both courses, you and you dive buddy will feel safer and more confident when diving together. 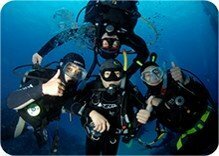 Specialty courses are a great way to develop and improve your scuba diving skills. 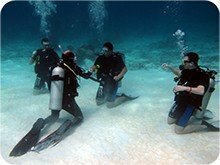 The purpose of the Specialty Diver Courses is to make divers familiar with the skills, knowledge and techniques for their favorite underwater activities and to introduce them to exciting new adventures. Student divers will read the Specialty Diver Manuals and go through with the instructor. They will then apply the knowledge they gain on the open water dives. Change your life! Become a PADI Divemaster: live and work in paradise. Your adventure into the professional level of recreational diving begins with the Dive Master Training program (DMT). Working closely with an Instructor, you will expand your dive knowledge and earn your skills to the professional level. Divemaster training develops your leadership abilities, qualifying you to supervise dive activities and assist instructors with student divers. After you completed your Divemaster course, now you can sign up for the Instructor Development Course (IDC), which will provide you with valuable hands-on training with the emphasis on fun and in-water application. The cutting edge knowledge gained will expand your Career Opportunities. With the help from our course director and instructors, you will refine your abilities to organize and supervise scuba diving activities, while working on developing teaching skills. PADI courses in Khao Lak, learn to dive at the Similan islands. 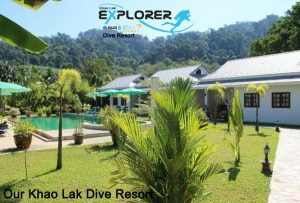 We learned to dive in Khao Lak with Khao Lak Explorer and it was one of the best experience of our holidays. Staying 1 night onboard for our PADI course was so much fun, the crew, food and instructor took good care of us and we had a great time.